Wednesday’s Feature Lot for the 2012 Foundation Auction! By now you’ve all marked your calendars for the Chairman’s Reception and Foundation Auction on Sunday, January 15 at the Double Tree in Denver, surely you’ve gotten all your presents wrapped, the cows are fed, and now you’re just kicking back and relaxing until all the family arrives! But after the holidays you may realize you forgot to get someone a present, or maybe you just didn’t get exactly what you wanted this year? 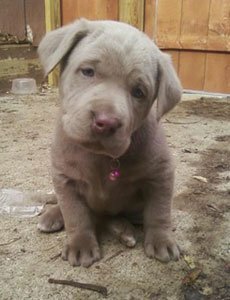 Don’t worry the AJSA Board of Trustees donated an extra special lot for the Foundation Auction— A Lazy H Labrador Puppy! These little guys have yet to be born, but keep checking back often for more info! You could have a little bundle of fur just like this one all to yourself! Many thanks to the AJSA Board of Trustees and Lazy H Farms! Posted on December 21, 2011 December 19, 2011 Categories 2011 NAILELeave a comment on Wednesday’s Feature Lot for the 2012 Foundation Auction! Be sure to check out the American Simmental Association and American Junior Simmental Association Facebook pages for candid photos as they’re uploaded! Class 39: Wesner Livestock Enterprises of Chalmers, Indiana with an April 3, 2011 GWS Ebonys Trademark 6N son, WLE PLE Trade Y5127. Class 40: Campbell Show Calves of Sycamore, Pennsylvania with a March 17, 2011 HTP SVF In Dew Time son, CSCX Storm Warning 461Y. Champion: From class 40, Campbell Show Calves of Sycamore, Pennsylvania with a March 17, 2011 HTP SVF In Dew Time son, CSCX Storm Warning 461Y. Reserve: Also from class 40, Adkins Cattle Company of Chandlerville, Illinois with a March 7, 2011 Adkins Mr Right On son, Adkins Red Rock Star. Class 43: Forest Brook Farms, LLC of Chilton, Wisconsin with a February 17, 2011 SVF Steel Force S701 son, FBF1 Combustible. Class 44: Forest Brooke Farms, LLC of Chilton, Wisconsin with a January 17, 2011 STF Dominance T171 son, FBF1Supremacy. Champion: From class 44, Forest Brooke Farms, LLC of Chilton, Wisconsin with a January 17, 2011 STF Dominance T171 son, FBF1Supremacy. Reserve: From class 43, Forest Brook Farms, LLC of Chilton, Wisconsin with a February 17, 2011 SVF Steel Force S701 son, FBF1 Combustible. Class 47: Silver Towne Farms of Winchester, Indiana with a December 27, 2010 STF Fixation W155 son, STF Endangerment XY94. Class 48: Larry Parr of Mason City, Illinois with a September 10, 2010 LMF Moving Forward son, SHS Progress X13B. Champion: From class Silver Towne Farms of Winchester, Indiana with a December 27, 2010 STF Fixation W155 son, STF Endangerment XY94. Reserve: From class 48, Larry Parr of Mason City, Illinois with a September 10, 2010 LMF Moving Forward son, SHS Progress X13B. Class 51: Brooks Cattle Company and Elmore Cattle of Calumet, Oklahoma with a March 20, 2010 SVF Steel Force S701 son Brooks Big Iron X057. Class 52: Circle M and Griswold Cattle Company of Rockwall, Texas with a February 25, 2010 LBS The Foreman 702T son OBCC GCC Brushcreek C47X. Champion: From class 51, Brooks Cattle Company and Elmore Cattle of Calumet, Oklahoma with a March 20, 2010 SVF Steel Force S701 son Brooks Big Iron X057. Reserve: From class 52, Circle M and Griswold Cattle Company of Rockwall, Texas with a February 25, 2010 LBS The Foreman 702T son OBCC GCC Brushcreek C47X. Class 55: Foster Brothers Farms of Lockney, Texas with a November 11, 2009 SVF Steel Force S701 son, FBFS Wheel Man 649W. Class 56: Walker Holland of Oakland, Mississippi with an August 2, 2009 Chub’s Tsunami 2R son, TAMU Sully W4002A. Class 57: Trennepohl, Hege, and Rolling Hill of Middletown, Indiana with a January 8, 2009 JS Burning Up 33R son, Triple C Opportunity. Champion: From class 57, Trennepohl, Hege, and Rolling Hill of Middletown, Indiana with a January 8, 2009 JS Burning Up 33R son, Triple C Opportunity. Reserve: From class 55, Foster Brothers Farms of Lockney, Texas with a November 11, 2009 SVF Steel Force S701 son, FBFS Wheel Man 649W. Grand Champion Bull: Trennepohl, Hege, and Rolling Hill of Middletown, Indiana with a January 8, 2009 JS Burning Up 33R son, Triple C Opportunity. Reserve Grand Champion Bull: Forest Brooke Farms, LLC of Chilton, Wisconsin with a January 17, 2011 STF Dominance T171 son, FBF1Supremacy. 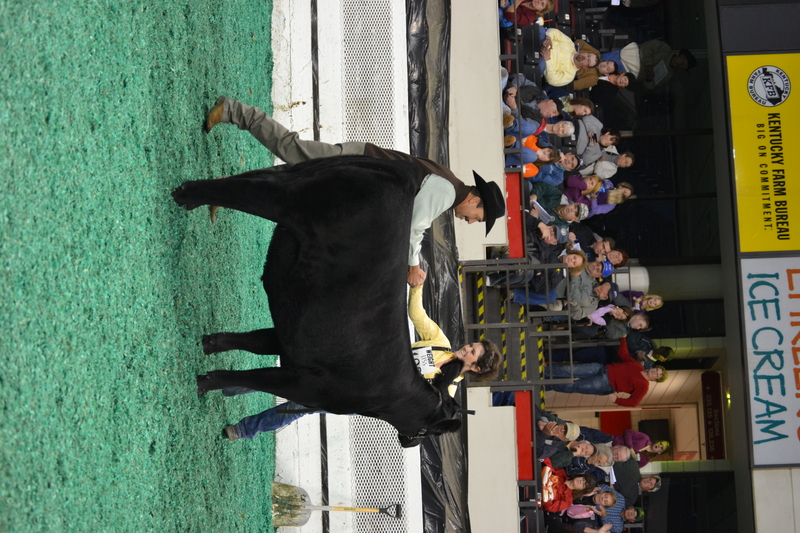 Grand and Reserve Simmental Females selected at the 2011 NAILE! Jirl Buck selecting Grand Champion Heifer, Syann Foster of Lockney, Texas with an October 1, 2010 SVF Steel Force S701 daughter, FBFS X-Clamation 76X. Judge Todd Herman selects Reserve Grand Champion Heifer-- Hudson Pines Farm of Tarrytown, New York with a January 17, 2011 JF Milestone 999W daughter, HPF/Borne Knockout Y030. Posted on November 16, 2011 December 15, 2011 Categories 2011 NAILE, UncategorizedTags 2011, naile, National Show, North American, show, SimmentalLeave a comment on Grand and Reserve Simmental Females selected at the 2011 NAILE! Class 1: Damar Farms of Strum, Wisconsin with a March 6, 2009 Triple C Singeltary S3H daughter, Triple C Miranda W529 with an October calf at side. Grand Champion Cow/Calf Pair: Damar Farms of Strum, Wisconsin with a March 6, 2009 Triple C Singeltary S3H daughter, Triple C Miranda W529 with an October calf at side. Class 3: Morgan Cook of Reed City, Michigan with her May 2, 2011 JR Poker Face daughter, JR Look To Me. Class 4: Damar Farms of Strum, Wisconsin with an April 3, 2011 DHF Drakkar W242 daughter, DMR/KA Dazzle Y276. Class 5: Hudson Pines Farm of Tarrry Town, New York with a March 23, 2011 STF Dominance T171 son, HPF Phylli Y333. Class 6: Anna Maulsby of College Station, Texas with a March 12, 2011 JF Milestone 999W daughter, HPF MS D21K Y957. Class 7: SVJ Farm of Amity, Pennsylvania with a March 2, 2011 LLSF Titan T200K daughter, Sweeney Cow Y103. Champion: From class six, Anna Maulsby of College Station, Texas with a March 12, 2011 JF Milestone 999W daughter, HPF MS D21K Y957. Reserve: Also from class six, Moore Land and Cattle of Alton, Illinois with a March 5, 2011 STF Dominance T171 daughter, Moore Sheza Star 40Y. Class 10: Isiah Bridwell of Covington, Indiana with a February 21, 2011 STF Shocking Dream SJ14 daughter, Flat Rock Y140. Class 11: Clair Trennepohl of Middletown, Indiana with a February 8. 2011 MR NLC Upgrade U876 daughter, HF Serena. Class 12: Circle M Farms of Rockwall, Texas with a January 29, 2011 SVF/NJC Built Right N48 daughter, WLE Gracie Babe Y854. Class 13: Hudson Pines Farm of Tarrytown, New York with a January 17, 2011 JF Milestone 999W daughter, HPF/Borne Knockout Y030. Class 14: Hudson Pines Farm of Tarrytown, New York with a January 2, 2011 JF Milestone 999W daughter, HPF Cream Soda Y010. Champion: From class 13, Hudson Pines Farm of Tarrytown, New York with a January 17, 2011 JF Milestone 999W daughter, HPF/Borne Knockout Y030. Reserve: From class 14, Hudson Pines Farm of Tarrytown, New York with a January 2, 2011 JF Milestone 999W daughter, HPF Cream Soda Y010. Class 17: Tingle Farms of New Castle, Kentucky with a November 11, 2010 SVF Steel Force S701 daughter, Anvil Acrs Beyond Belief. Class 18: Foster Brothers Farm of San Augustine, Texas with a November 2, 2010 SVF Steel Force S701 daughter, FBFS X-Pectation 225X. Class 19: Syann Foster of Lockney, Texas with an October 1, 2010 SVF Steel Force S701 daughter, FBFS X-Clamation 76X. Class 20: Aubrey’s Cattle and Diamond M of Monrovia, Indiana with a September 15, 2010 GWS Ebonys Trademark 6N daughter, Remington Blackblaze 316. Champion: From class 19, Syann Foster of Lockney, Texas with an October 1, 2010 SVF Steel Force S701 daughter, FBFS X-Clamation 76X. Reserve: From class 18, Foster Brothers Farm of San Augustine, Texas with a November 2, 2010 SVF Steel Force S701 daughter, FBFS X-Pectation 225X. Class 23: Harker Simmentals of Hope, Indiana with a May 2, 2010 GWS Ebonys Trademark 6N daughter, Remington Blaze 221X. Class 24: Jake Bloomberg of Berwick, Illinois with an April 10, 2010 SVF Steel Force S701 daughter, Brooks Steelmagnolia X57. Class 25: Dalton Lemenager of Clifton, Illinois with a March 24, 2010 HTP SVF In Dew Time daughter, HPF Queen of Hearts X954. 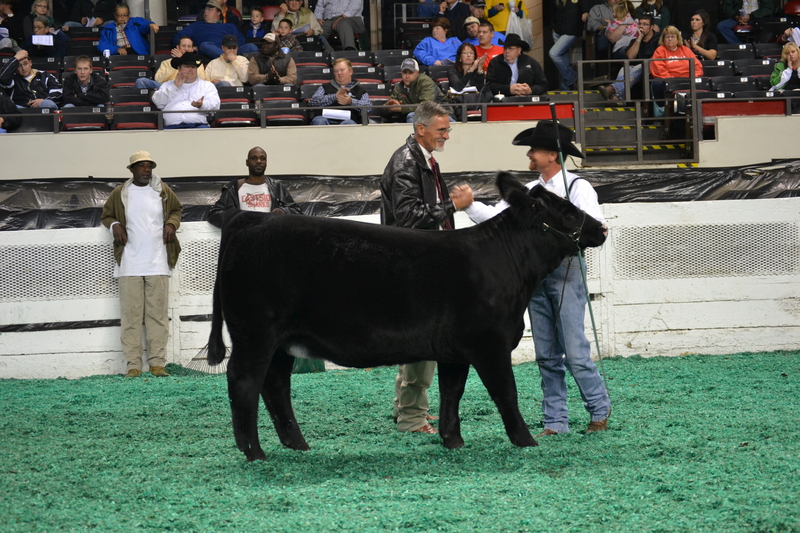 Class 26: Circle M Farms of Stillwater, Oklahoma with a March 5, 2010 GWS/SCF Rendition daughter, OBCC Sadies Girl RTOX. Champion: From class 24, Jake Bloomberg of Berwick, Illinois with an April 10, 2010 SVF Steel Force S701 daughter, Brooks Steelmagnolia X57. Reserve: From class 23, Harker Simmentals of Hope, Indiana with a May 2, 2010 GWS Ebonys Trademark 6N daughter, Remington Blaze 221X. Class 29: Makayla Williams of Chandler, Illinois with her February 15, 2010 GWS Ebonys Trademark 6N daughter, TSFS Karen. Class 30: Black Watch-Hudson Pines of Tarrytown, New York with a Lazy H Pathfinder R104 daughter, HPF Miss Pep X304. Champion: From class 30, Black Watch-Hudson Pines of Tarrytown, New York with a Lazy H Pathfinder R104 daughter, HPF Miss Pep X304. Reserve: Also from class 30, Carly Wesner of Chalmers, Indiana with her January 28, 2010 CNS Dream On L186 daughter, WLE Crocus X4293. Class 33: Tanner Howey of Rockwall, Texas with his November 7, 2009 SHS Navigator N2B daughter, HPF Ms Desa Rae W102. Class 34: Tingle Farms of New Castle, Kentucky with an October 16, 2009 JF Shock and Awe 6207S daughter, Silverstone LPC Miss Awe. Champion: From class 34, Tingle Farms of New Castle, Kentucky with an October 16, 2009 JF Shock and Awe 6207S daughter, Silverstone LPC Miss Awe. Reserve: From class 33, Class 34: Tingle Farms of New Castle, Kentucky with an October 16, 2009 JF Shock and Awe 6207S daughter, Silverstone LPC Miss Awe. Grand Champion Heifer: Syann Foster of Lockney, Texas with an October 1, 2010 SVF Steel Force S701 daughter, FBFS X-Clamation 76X. Reserve Grand Champion Heifer: Hudson Pines Farm of Tarrytown, New York with a January 17, 2011 JF Milestone 999W daughter, HPF/Borne Knockout Y030.